The second debate was difficult to watch. I found myself at some points screeching, squirming, cringing — anything to distract from what was happening on screen. It was miserable and disheartening and basically the same as the first one — no matter what side of the political spectrum you fall on, we can all agree that it’s horrendous that this will be happening yet again, in Las Vegas, in just a few weeks time. There was one good thing that came from it, I’d argue, and that thing was a very simple Twitter meme. No, not the merciless taunting of poor Kenneth Bone, but a single shot of the candidates debating — they look like they’re singing. It’s stupid, but you have to hand it to Twitter. We’re completist. Any duet you could possibly think of? Someone’s put it alongside that image. By all means, do it. Search any duet! 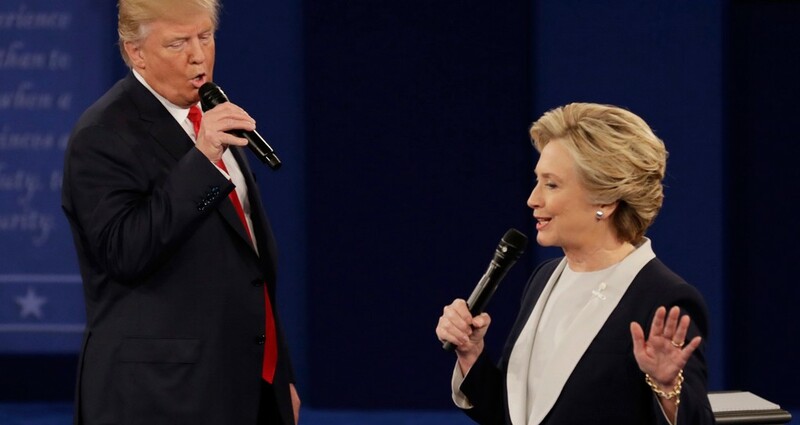 Trump and Clinton belting it out, their voices (I imagine) wrapping together in delicious harmony. "…even when I'm with my boo, boy you know i'm crazy over you." There you have it. A feel good meme for a not-so-feel-good time.